I had this die cuts set from Spellbinders since few years, and only did one card with it long ago (for the Oklahoma tornado). And I don't know why because it's a beautiful set ! I think I wasn't inspired until I look back at these Christmas papers (Recollections) and saw that the contrast between the light cream and the dark red was perfect for it. I added Tea dye distress ink (Ranger) over the die before taking it off the paper to emphasize the design, and added it over the lace too. The poinsettia is a stamp by La Compagnie des Elfes (French stamp company), with few leaves (I Am Roses) and cream pearls. Is it more a vintage or a shabby look ? Anyway this card screams Christmas time ! Thank you for stopping by today. 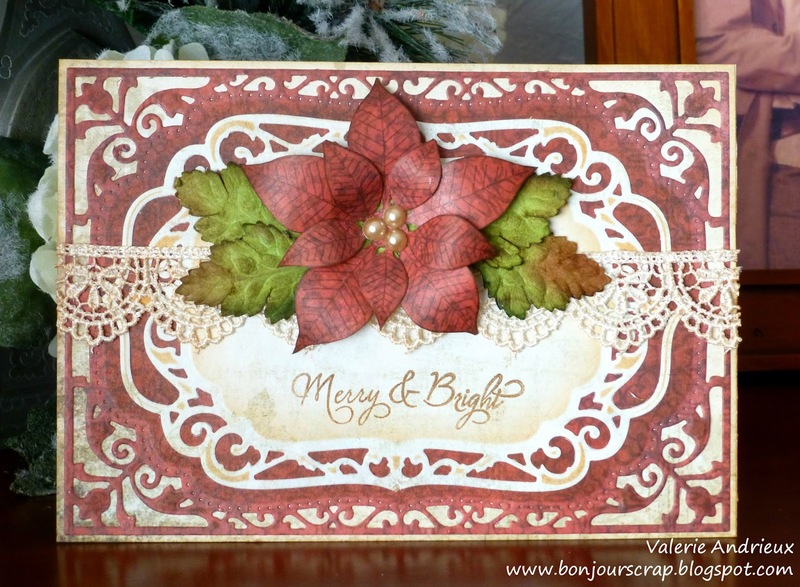 I hope you already comment on my Christmas cards to enter my giveaway (and follow my blog too). If you didn't it's not too late : the more cards you comment, the more chances you have to win my DCWV Christmas prize ! See you tomorrow for another card !